Inspire customers to take action with DealCash, a new premium incentive from Access Development. A low-cost, high-value alternative to restaurant certificates, gift cards, and travel vouchers, DealCash awards consumers virtual dollars to spend on deep discounts at local restaurants, retailers and more. They save hundreds at restaurants, retailers, and other merchants in their communities and abroad. Customer appeal. 96% of the population uses coupons, and most spending occurs close to home. With over 150,000 coupons at local merchants, your customers can save big on everyday purchases with DealCash discounts. Low Cost. Premium incentives need to deliver the right balance of cost and value to drive the results you need. 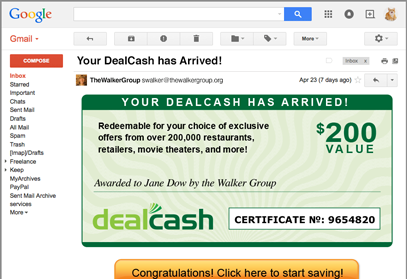 DealCash licenses begin at just $3 for a $25 reward. Multiple Usage. DealCash isn’t just designed to drive one action. It’s also meant to extend brand engagement by encouraging multiple usage across weeks and even months. The more they save, the more your brand will benefit from the positive exposure. You get a high-value, low-cost incentive, and Access handles the online fulfillment and implementation on behalf of your organization. If you need to drive customers to complete an action or take the next step with your brand, DealCash can help you get there for less. To learn more about DealCash, contact us today for a free, no-obligation demo.